Craig Jenkins is renowned in his native UK, for his holistic approach to storytelling. He has performed at a number of high profile organisations, such as the BBC, the Barbican Centre, Somerset House and the British Museum. Working for the past five years as the resident storyteller and international ambassador for the Vayu Naidu Storytelling Company, UK, Craig is currently writing his first full length play ‘Guilt’; an interpretation of the Ramayana epic from the perspective of Surpunakha. 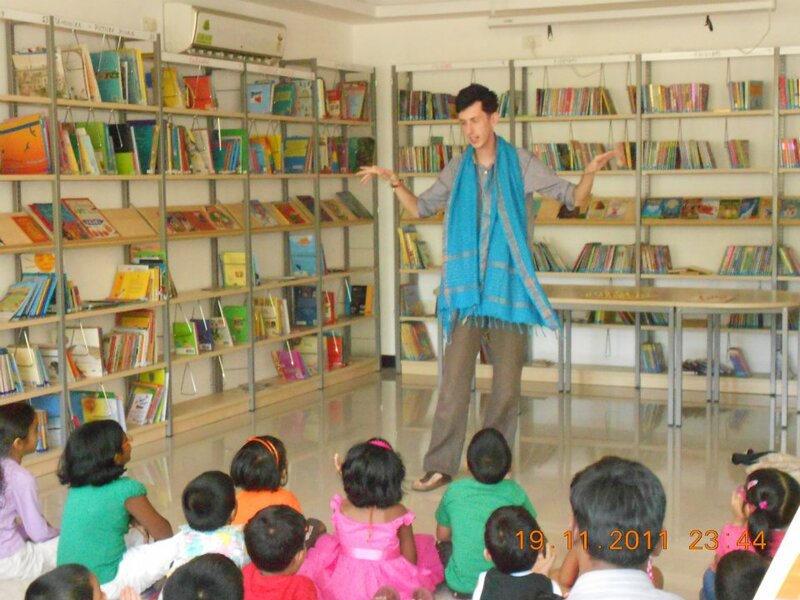 In 2010 Craig came to India and dazzled at Hoo’s Tales. While there he also took an artist in residency position at the Kattaikkuttu Gurukulam (Tamil Nadu), as well as leading workshops and performances for Tulika, Open Space, Pune, SOS Children’s village and a number of schools in Bangalore, Chennai and Pune. Here is an inspiring peek into the mind of the gifted and loved story teller, Craig Jenkins. ST- What brought you into story telling? Craig- I first encountered performance storytelling during my Bachelors degree. I was studying Drama and Film Studies at the University of Kent and one of the classes I chose to take was ‘Storytelling: Oral Traditions of India’ taught by world-renowned storyteller, Dr Vayu Naidu. I remember the first story Vayu told our class was the Tamil folktale of ‘The Monkey, The Crocodile and the Rose-Apple Tree’. I was in awe; completely struck by how a simple old folktale could resonate and engage so strongly with a group of students. I next heard the Ramayana and was hooked. Upon finishing my course, Vayu invited me to train under her apprenticeship programme, which including learning the methodology of Vayu Naidu Company and working in a number of performance, education and outreach projects. In 2007, I was invited to join Vayu Naidu Company as resident storyteller and in 2012 I became to Artistic Associate and International Ambassador. Do you prefer narrating old folklore or contemporary tales? I like to perform old folklore with a contemporary masala twist. I enjoy taking old stories and reworking them with rhyme, rhythm and energy, and placing them in the here and the now. My absolutely favourite stories to work with are the Indian epics of the Ramayana and the Mahabharata. I have never found any other stories that speak so much of the world today. I am particularly interested in exploring the ‘human’ sides of the raksha characters, trying to find the light within their dark. What kind of training does one need and what makes one a successful storyteller? The advice I would give anybody wanting to become a successful storyteller is to be your self. Storyteller is not about ‘playing a role’; it is about just being. Audiences connect when a storyteller is being true to who they really are. Who are your favourite authors and storytellers? Why? One of my favourite authors has to be DevduttPattanaik. He has an incredible ability of taking deep philosophical and religious material and writing it in such a clear, evocative and accessible way. For storytellers, Vayu Naidu, still always inspires me with the grace and elegance of her telling and her ability to seamlessly bring the ancient epics and traditional folktales into the contemporary world. I know no storyteller who has as much energy and life as JeevaRaghunath. Her characterisations of the old-woman, the rabbit and the monkey, are some of the best I have ever seen. Mr P. Rajagopal (of Kattaikkuttu Sangam) has so much integrity and innovation in preserving tradition and telling ancient stories that really connect with the lives and experiences of audiences today. Why this interest in India? India is the place where I feel most alive. Do you like using unknown/ unfamiliar stories or prefer doing Indian ones with the audience? How do you choose? I like to mix it up. I always choose the stories that I feel are right for a particular group at a particular time. As I work with the oral tradition and never learn a story word for word, even if I perform a familiar story it will be different with every telling. One of the things I love about being a storyteller (in scenes across the globe) is that I don’t fit the stereotypical image of a storyteller. Everyone expects a storyteller to be older, generally a woman, white hair and a stick. I am twenty six (although look about eighteen), love to wear Mickey Mouse T-Shirts and illuminous colourful trainers, and have an obsession with Ravana and his ‘raakshas’ family. I like to show, in both the UK and India, that storytellers can come from any walk of life and share stories in any style they choose. Storytelling is open and accessible to all. You are known to incorporate Indian pop culture into your stories while performing in India. How do you go about doing that? I talk to people. All of my friends, students, fellow performers, teachers, waiters I meet in restaurants, the auto-rickshaw drivers who drive me home. I ask them what music they listen to, what movies I should see at the cinema, who are the ‘heroes of the moment’. For me it is about creating a context and understanding where my stories can be placed in their lives. Children and young adults are obsessed with modern technology, cinema and multimedia, so I try to make references about things they know and like. I never let these take preference over the essence of the story though. They are small details to help connect with the audience. The meaning of the story always stays the same. At a performance at Hippocampus, Chennai, I took an old North-American folktale entitled ‘The Legend of Jumping Mouse’ and gave it a Tamil-flavour. I included songs from the popular Tamil movies ‘Kavalan’ and ‘Singam’, used some basic Tamil words and phrases and also drew on my own observations of living in Tamil Nadu. The audience loved it especially my dance rendition of ‘Ad dradranakkamukkanakkamukka!! These didn’t change the story. It was still a tale about a little mouse follow his inner voice and finding his calling and talking to the audience afterwards they too could connect with a time when they too followed their heart and headed for their dreams. If I perform the story again, in the North of India, I would draw on my knowledge of Hindi movies, so replace Surya and Vijay with Shahrukh Khan…. What are your thoughts on Story reading versus Story telling? Both are incredibly important in early child development and actually work well in tandem with each other. In the UK, Vayu Naidu Company works in collaboration with TULIKA publishers in an initiative entitled ‘The Live Literacy Tour’, which uses oral retellings/performances of books to encourage children to read. Would you like to share any anecdotes with us? In March 2011, I was preparing to head back to the UK after running a 4 month Ramayana project at the Kattaikkuttu Gurukulam, Tamil Nadu. It was the last day of the project working with the older students and I was feeling very tearful. I had made real connections with incredible students and felt soso sad to be saying goodbye. As I sat on the ground, collecting my paper and books, Kumar, probably one of the most compassionate people I have ever met, came and sat by my side. I felt his arm on my shoulder and his sweet voice saying: ‘Anna (brother), don’t cry. You did so much for us coming here. Before you came we only knew one Ramayana. Now, with your ideas and your style, we can see our old stories in new and different ways. You make us so happy with your stories, brother’. 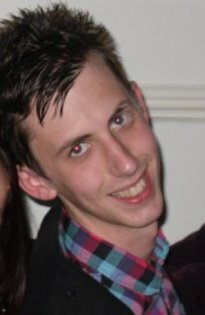 A pleasure to have you here Craig, thank you! Wow! Amazing! Thanks for bringing him to light. Didn't know about him at all.. I would love to see his nakamukkah! dance. sounds very interesting. Any story session happening with craig jenkins in bangalore? Thank you, Craig for dropping by! What a lovely interview, Art! Lovely lovely interview. We had the opportunity to see Craig in person during launch of Bonbibi forest book. 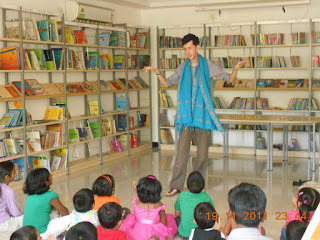 His forte is that he involves the kids+adults in the audience during his story telling sessions. I remember him talking about Ra.one movie while describing the evil character in the book. Most of the kids instantly made the connection. One enthusiastic kid removed the display book and started to read it there itself and Craig immediately incorporated that in his story. That was some quick thinking on his part. I guess that's why he is very popular. All the best to Craig.Thanks Art for this lovely interview. I'm ashamed to say Craig Jenkins is new to me, but he sounds amazing! I hope I get to listen to his stories in the UK in the future. Great to have you here Zoe. I also attended his workshop with Jeeva. he is charming! "India is the place I feel most alive' - totally relate!